You will earn 6,104 Reward Points. Earn 1 reward point for every 1 dollar spent. 35,000 BTU/hr. baker’s depth standard oven cavity. Full size sheet pans fit side-to-side or front-to-back. 35,000 BTU/hr. 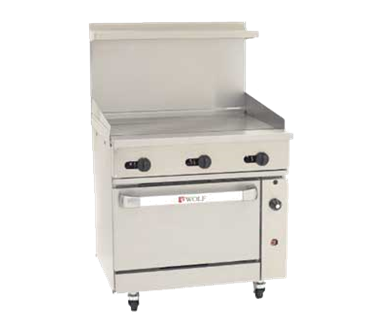 convection oven in place of standard oven, 24"d x 26 3⁄8"w x 137/8"h (115v - 1 phase blower motor 4 amp, 6' cord and plug), includes three oven racks. Full size sheet pans only fit side-to-side in convection oven. Convection oven motor requires field attachment. 120v/60/1-ph, 4.0 amps, 6' cord & plug, std.